The closest recreational pot shop to Boston will open this weekend in Brookline, Massachusetts, and they are preparing for a crowd of thousands. New England Treatment Access is located inside a building that used to be a bank at the busy intersection of Route 9 and Washington Street. It is already a medical dispensary. Recreational sales will start at 9 a.m. on Saturday. NETA's director of operational compliance, Amanda Rositano, said they have more than doubled their employee base in Brookline to prepare for adult use sales, and they have made sure they will have enough inventory. There will be modest limits on what customers can purchase, and roughly a third of their product will be reserved for medical patients. The first recreational marijuana dispensary with MBTA access is opening Saturday. More than a dozen Brookline Police officers will be on site to deal with the crowds and the traffic. NETA agreed to open on a Saturday so the town has time to test the traffic plan before Monday morning's commute. Parking will be extremely limited, with a few spots reserved for medical patients and more at the Homewood Suites down the street. The line will start in NETA's own parking lot and can wrap around the building all the way to White Place in Brookline before it's cut off. The chair of the town's select board, Neil Washinsky, will be the first customer. "This was my bank some years ago," Washinsky said. "It's kind of funny to go in here and see it transformed into something else, but I think we're as ready as we'll ever be." 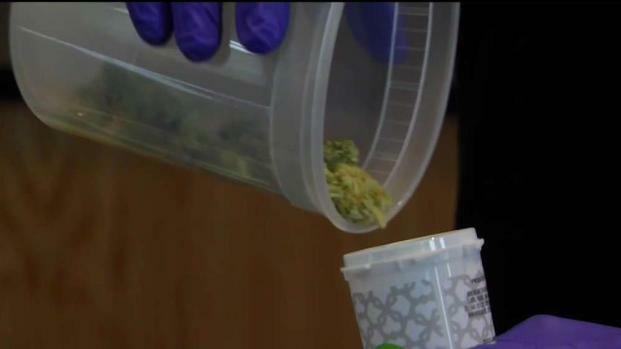 Medical customers of the shop are worried about what recreational sales will mean for them. Some area business owners are concerned about travel impacts in an area that already has a lot of traffic and limited parking. The owner of La Morra, a restaurant across the street, is hoping to capitalize on the cannabis by starting lunch service. NETA's location in Northampton was one of the first two stores to sell marijuana products to recreational customers in the eastern U.S.